Lebanon was the leading country among those surveyed in innovative business startups (Image via Stockvault). 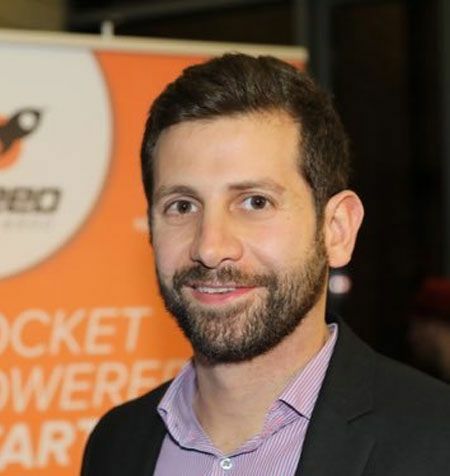 Editor's note: This article has been updated to include the insights of Jad Salame, managing partner of Phoenician Funds. The second edition of the Lebanon National Report for 2016, prepared by the UK Lebanon Tech Hub, revealed that Lebanese youth are bulge powering the country’s tech scene. The national report is taken from global research by the GEM Consortium, who conducted wide-ranging and detailed interviews to assess levels of entrepreneurship across 65 countries. This included 2,600 adults aged 16-64 right across the Lebanon. Image via UK Leb Tech Hub. Lebanon was the leading country among those surveyed in innovative business startups, or the proportion of new businesses seeing themselves as introducing new products or services, with few competitors. The report also showed Lebanon is among the world’s leading entrepreneurial economies, ranking fourth of 65 countries in terms of new firm enterprise, eighth in terms of total early-stage entrepreneurship, and third in terms of the ownership of established businesses. The report shows that two in seven 25-44 year olds were starting or running a new business in Lebanon in 2016. It also shows four out of ten, (of those not already doing so), questioned said they intended to start their own business within the next three years. Taken together, in 2016 more than four in ten adults in Lebanon were active entrepreneurs, starting or running a new business, or running an established business. 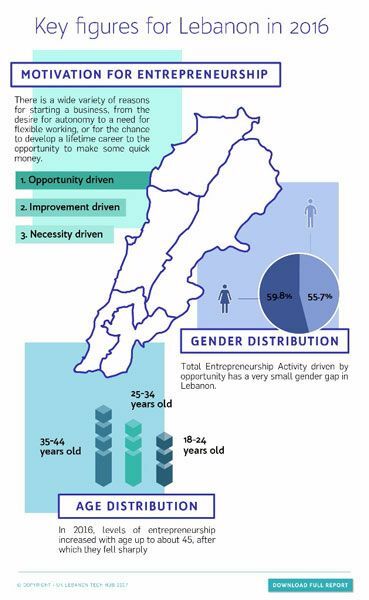 Women are increasingly taking the lead in Lebanon’s startup scene with 16 percent of those surveyed saying they were involved in early stage entrepreneurial activity – more than twice the level recorded in Europe (six percent) and a third more than in the US (12 percent). In the survey, six out of ten Lebanese adults saw good opportunities to start a new business, more than two-thirds considered themselves to have the required skills and capabilities to do so, and less than a quarter of those would be deterred by fear of failure. As a result, four out of ten intended to start a new business within the next three years. Compared to 2015, there has been a sharp increase in the share of early stage entrepreneurs who say they started a new business because of necessity (i.e. the lack of income alternatives), rather than to seize a business opportunity. This leads towards a rise of entrepreneurship that is related to the deteriorating employment opportunities in the country. But still, ecosystem stakeholders still believe that this is not the main driver for entrepreneurs who venture led by their passion, and commitment to make a difference. Sami Abou Saab (Image via Twitter). According to the report, almost two-thirds of early stage entrepreneurship in Lebanon in 2016 were in the retail/wholesale sector, with less than a quarter in professional Services. By contrast, the European averages were less than one-third in retail/wholesale and almost a half in professional services. Sami Abou Saab, CEO of Speed@BDD believes that newborn startups are focusing on tech and digital retail, rather than classic brick and mortar one. Digital retail mostly channeled through social media is accessible which is driving more people to venture in. However, Abou Saab said that this is not the type of retail that would disrupt the industry, rather an innovative and new product. Experts saw the internet/physical infrastructure, political instability and corruption, and the outdated business laws and regulations, as the major constraints on entrepreneurship. However, the factors supporting entrepreneurship included the growth in entrepreneurial funding, an improving entrepreneurial support system, (including incubators, accelerators etc.) and an open, supportive culture. Balancing between the two wings, Abou Saab said that things have started remarkably improving and changing from the government’s side, especially when it comes to the evolution of policies, and rules and regulations, in addition to Circular 331. Several meetings and discussions between the private and the public sector are taking place in order to reach innovative programs that would enhance the ecosystem’s development process. These include discussions with the Ministry of Education to introduce coding to the youth, in addition to talks with the Ministry of Justice that would boost the legal aspects. According to Abou Saab things are changing, but slowly. However, this is the case with all governments worldwide, which are usually bureaucratic and hindered by formalities. Jad Salame (Image via Phoenician Funds). 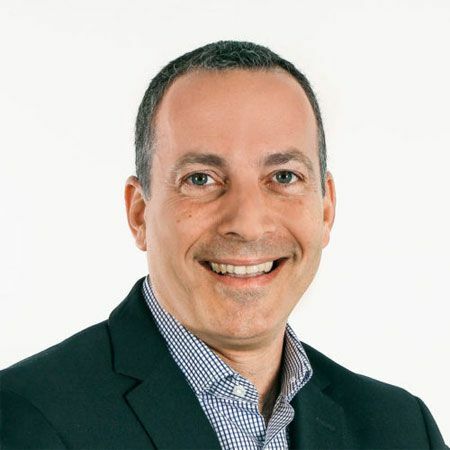 According to Jad Salame, managing partner at the Phoenician Funds, the ecosystem has made significant progress since the launch of the BDL’s Circular 331. 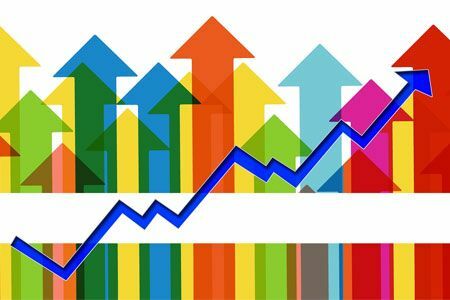 "In less than four years, the country has witnessed a massive shift in terms of putting the right foundations including access to capital, incubators, bootcamps, accelerators, VCs, technical resources etcetera. The impact is now tangible when looking at the number of funded companies, jobs created, traction and reach. However, we still require unfortunately the basic infrastructure to operate companies in Lebanon including legal, administrative, telecommunication, data/ internet and utilities (i.e water and electricity). In Lebanon, we need, on average, to go through 12 to 15 steps to establish a company compared to an average of seven steps in developed countries," he explained. He continued: "There are few governmental incentives to encourage and attract companies to set up in the country such as tax breaks, reduced stamp duties etcetera. On a different note, the VC/startup culture is new to the country and we are still in the adoption process." The report highlighted various recommendations to promote entrepreneurship including more enterprise training and education, faster/cheaper internet and updated business laws and regulations. However, Abou Saab pointed out the importance to have a mindset shift when it comes to VC money. He said that VCs need to act more like VCs and start embracing risks. “We need VCs that are ready to take real risks and invest in startups. Many of the big successes around the world have failed multiple times before reaching success and that's what we need in Lebanon, VCs and investors willing to fund those failures, for the whole ecosystem to generate big successes. The Central Bank Circular 331 already subsidized a big part of the risk and VCs should be willing to leverage that with an open and non-conservative mindset,” he said. 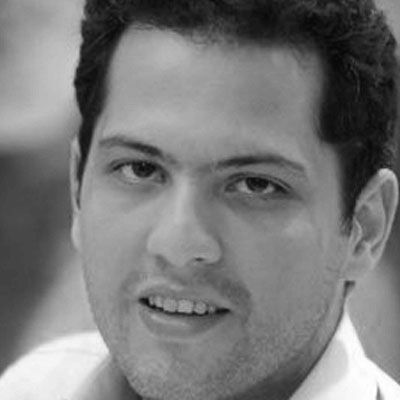 Nicolas Rouhana (Image via IM Capital). Nicolas Rouhana, general manager of IM Capital, continued saying that most 331-VC funding is geared towards big tickets and later-stage financing. 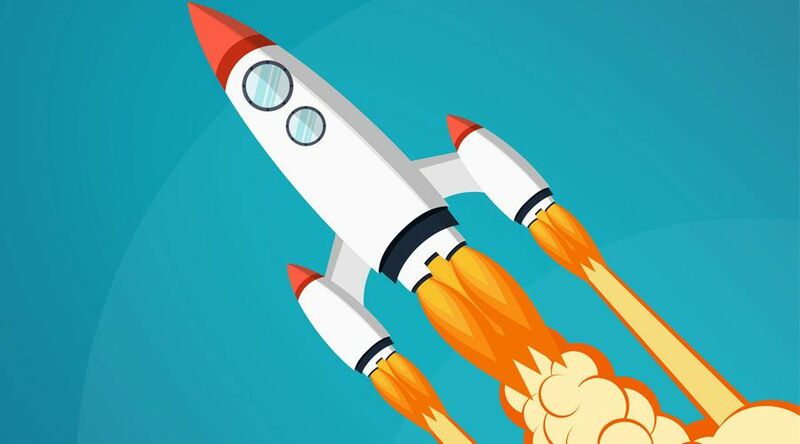 “A current funding gap exists for a startup that comes out of an accelerator to reach VC funding, and this gap needs to be bridged by more early-stage and seed funds. This is crucial for the survival of startups and to scale deal-flow,” he concluded. 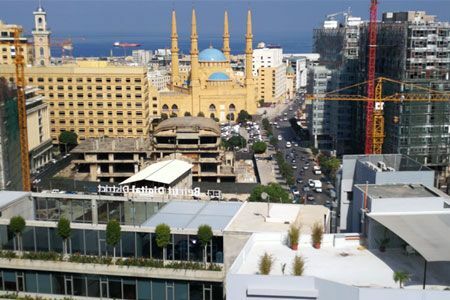 Commenting on the fact that some VCs are still playing it safe in Lebanon and preferring a low-risk later stage investment rather than funding seed-stage and early stage startups, Salame said that this is relative to each fund’s risk appetite and strategy. "From the Phoenician Fund I’s side, the majority of our portfolio is seed stage as per our initial investment strategy," he added. He continued: "I strongly believe that the industry has huge potential in the region where technology is being adopted through mobile phones, data and other. We have an emerging young population that is becoming more and more educated and into technology and understands perfectly its benefits. Through technology a lot of the region’s problems could be solved from education to financial inclusion, transportation, logistics, ecommerce etcetera. I see great untapped opportunities with significant scale. In addition, Governments are also mobilizing to support the ecosystem (e.g., Lebanon, UAE, Saudi Arabia) in funding, better regulation, sandboxes, incentives etc." Salame also spoke about the private sector through its investors who were used to real estate brick and mortar asset classes. These stakeholders are now expressing their interest in investing in startups and VCs, and started to look for partnerships. "The challenges remain in channeling resources into value creating companies, sectors and themes. In addition, we have to make sure that the ecosystem in general is built on very solid grounds apart from the availability of the funding,' he concluded.